Customer experience is a key determinant of a fitness brand’s success in the market. In 2015 over 55% of customers globally vouched they were willing to pay more for guaranteed good customer experience. According to a recent Walker study, this number will be as high as 86% by 2020. How potential clients perceive the experience they expect from your fitness business will soon outweigh your products and price tag. For successful online personal trainers providing excellent customer experience may become the single-most important factor for signing up prospects and retaining current clients. Customer experience, or in the online space, user experience starts with your online personal training website, all the platforms you use for your online marketing and the online personal training platform you employ to deliver your fitness services. Only 1 in 26 customers complain about poor customer experience to the business owner, the rest will just leave. This leads to customer churn as high as 67%. Good customer service can improve customer experience. Here are 6 easy ways to engage your online personal training clients and improve their interactions and experience with your business. Having a desktop website isn’t enough. 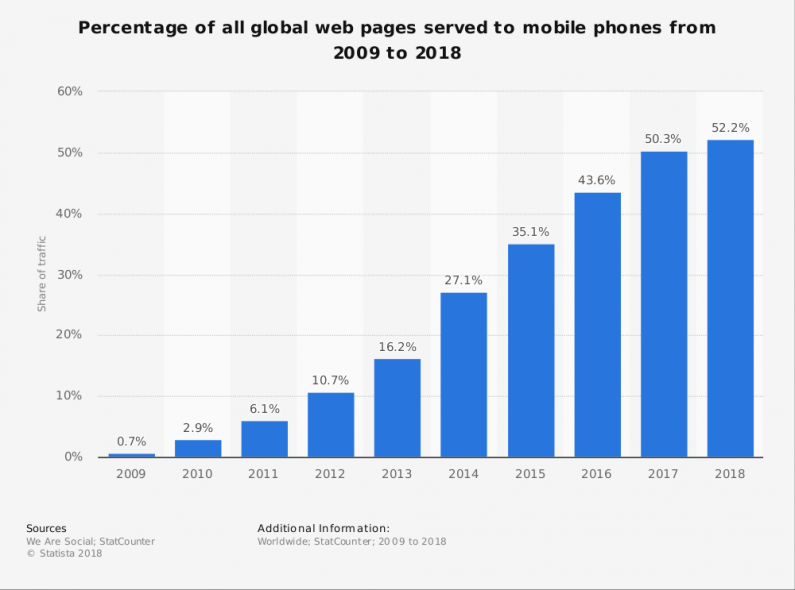 Research shows that in 2018 52.2% of the global online website traffic was generated through mobile. It’s safe to say that a great way to improve client experience is to provide clients with a dedicated software and website that’s mobile optimised. When you give your clients a mobile-optimised experience, you give them the power to access workouts on-the-go. They can take a look at their daily workout plans in advance, ask questions and get answers, renew/upgrade subscriptions and share your website with loved ones instantaneously. When your fitness service makes your clients’ life easier by making their workouts and support easily accessible to them, they will be happier than before and value your business more. A rewards & loyalty program will go a long way to help you establish a lasting positive relationship with the client. Rewards and loyalties in the form of discounts on subscriptions, freebies and complimentary gift vouchers to sporting/health stores are all excellent ways to make clients happy. When clients are happy, they tend to recommend your fitness services to their loved ones. Encouraging customer referrals will create strong bonds with your clients, while simultaneously increasing the number of highly qualified new leads. The right content can do wonders for your fitness brand. It can also aid you in your effort to provide your customers with a truly memorable experience. Start by understanding the kind of content your ideal clients love to consume, explore what challenges they face and how you can help to overcome them with your content. Be present in niche specific social media groups and communities and observe what type of questions people ask. Obeying the group rules feel free to give out advice and position yourself as the expert in the field. You can even launch your own social media group and use open questions, polls and a variety of curated content to spark conversation and get your audience to open up about their interests. Find out what your audience like to hear and read about and start blogging, vlogging or streaming live videos. One of the most cost-effective ways to streamline customer service is to be responsive on social media. Keep your clients informed about your availability on social media and use platforms like Facebook and Twitter to address customer queries and complaints. This should supplement your support with chat and email to create an incredible overall experience. Creating blog posts/ videos that you can link to with answers to all of your most commonly asked questions will save you time and give potential clients a great impression of you and your business. Studies show that businesses that provide consistent service quality across channels have a 92% retention rate. Money matters are sensitive in every country and culture. This is something you need to be aware of if you intend to run an online personal training business for a global client base. Slow payments, complicated settlement systems and unknown payment portals can irritate clients and rouse suspicion when they wish to renew their membership subscription or upgrade to a higher one. To improve customer experience, it's important to use payment gateways that are designed to have a streamlined and quick payment procedure Stick to traditional, established gateways like PayPal which are recognised the world-over and which are extremely user-friendly. Research shows that brands that focus on omni-channel marketing retain as much as 89% of customers. This omni-channel marketing includes everything from PPC advertisements to social media engagement and search engine optimisation. When you reach out to your existing clients across multiple channels, you reinforce the strength of your fitness brand image. This reassures them that they’ve made the right choice of investing in you. You could also use omni-channel marketing to create a seamless experience for your customers. Think of social media accounts linked together, Facebook re-targeting to promote your services or content to your website visitors and using SEO to optimise your PPC ads. These strategies can strengthen each other and provide a smooth process for your prospective clients to get to know your online fitness better. Have you got questions or would like to learn where PT Distinction fits into your customer experience aspirations? Feel free to get in touch.